A University of Hawaii-Manoa student art project is back on display this week after triggering a campus security scare that caused police to respond. In a case of art imitating and then influencing reality, the project took the form of an empty security guard post with video screens showing footage of a man brandishing a gun. At least one passer-by took the video for the real thing Thursday and alerted campus security. Guards and police began to evacuate the UH-Manoa Art Building and briefly detained one man before realizing the video was a type of performance art. With the Virginia Tech shootings still resonating across campuses, UH officials say the false alarm shows they are prepared for a similar emergency. With campus nerves still jittery in the wake of the Virginia Tech shootings, a University of Hawaii student art exhibit has proved too graphic for comfort, drawing an armed response from police. At least one suspect was detained Thursday before officers realized the video exhibit, meant to illustrate today's climate of violence, showed a looped tape rather than a real gunman. UH-Manoa officials said yesterday the error shows that campus security is well prepared for just such an emergency. "Securrorism" is a mock security station with five dusty surveillance TV monitors, a ratty chair and desk that is positioned at the front of the gallery. Four of the screens had live footage of the entrance of the art gallery at the Manoa campus. One screen, though, features a looped video that fooled police officers and campus security guards. The five-minute-long video is of a man with wavy hair and a hairy chest in the back of the art gallery. He is fully dressed in one scene and then stripped down to his boxers in another. For most of the time, he's sleeping, scratching and sulking around. But for about 10 seconds in the video, he angrily waves a small black gun, actually a toy. A 37-year-old Ewa Beach man walked passed the closed gallery at 8:10 p.m. Thursday and spotted that part of the video. "I believed that someone was actually in the museum with a handgun and posed an imminent danger," a campus security report quotes him as saying. 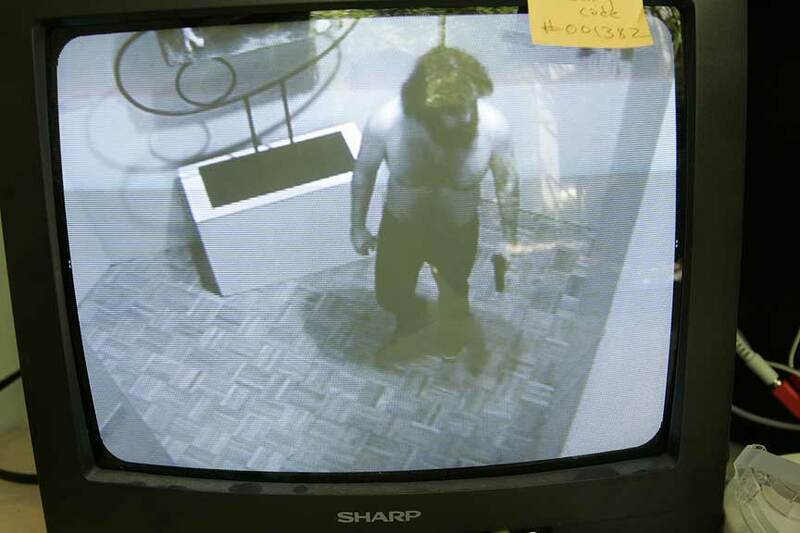 He notified campus security guards, who arrived at the gallery, Room 141 of the Art Building, two minutes later. They went straight to work, first securing the gallery and then evacuating the entire building. Students in nearby classrooms locked the doors and even pushed their bodies against them just in case. Others crouched behind desks, warning others to get down as well. Honolulu police, alerted by campus security, arrived at 8:15 p.m. with guns raised. Nicole Sterman, a junior majoring in art, was on the third floor. Once she saw the police, she knew what was up. "I yelled to them, 'You guys, it's just an art piece! It's prerecorded,'" she recalled. During that time, officers also detained a person near the Art Building who looked like the wavy-haired model in the video. Ultimately, Sterman heard someone on the police radio say, "Ho, it's just one art piece, brah!" The creator of "Securrorism," photography art senior Carl Lindstrom, had no idea his project would draw the attention of armed police officers, but is glad students are stopping to observe the artwork. "I think it brought awareness and that's what I wanted," Lindstrom said. "That's the goal of every artist." A university spokesman said yesterday Lindstrom's project also illustrated that the campus security and HPD are prepared for these types of situations. "They acted out of an abundance of caution, and that's what we'd want them to do," said UH-Manoa spokesman Gregg Takayama. "It's a reminder that the Virginia Tech shooting is so fresh in our minds, though we are thousands of miles away." At Virginia Polytechnic Institute in Blacksburg, Va., on April 16, gunman Cho Seung-Hui opened fire in a dormitory and classroom building, killing 32 people before committing suicide. "Do not be afraid. Do not call police." The University of Hawaii campuses tested a new emergency notification system yesterday to send recorded phone messages and e-mails to more than 100 people who manage reaction and responses during a crisis. The NTI Connect-ED system, which is also used by several Honolulu private schools, sends out messages automatically to phones and e-mail addresses. Prior to Connect-ED, UH sent out e-mails for all its students and faculty. UH officials began looking into other notification systems after October's earthquake, which resulted in major power failures, limiting e-mail and cell phone service. Additionally, UH is planning to adopt a system to send text messages to the 60,000 students, faculty and staff. Officials are also looking into less high-tech notification systems, such as sirens and public announcement systems.